PRESCHOOLERS WILL CHEER the return of Duck and Goose in their fourth board book appearance. This time, Duck and Goose are looking for the perfect pumpkin. Is it in the log? Is it under the leaves? Is it in the apple tree? 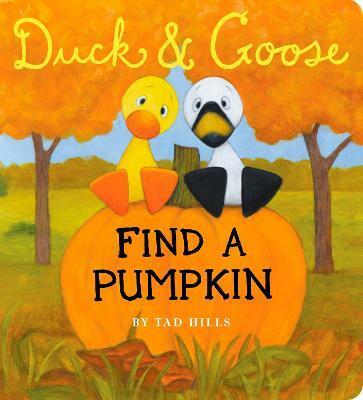 Young children will surely enjoy going on a pumpkin hunt with Duck and Goose . . . especially when they find the perfect pumpkin at the end! Tad Hills is the author and illustrator of the ALA Notable Book Duck & Goose--called "expressive" and "adorable" in a starred review from Kirkus Reviews--and Duck, Duck, Goose, both New York Times bestsellers. His Duck & Goose boardbooks include the ALA Notable Book What's Up, Duck?, Duck & Goose 1, 2, 3 and Duck & Goose: How Are You Feeling? He is also the illustrator of Waking Up Wendell, My Fuzzy Friends, and Knock, Knock, Who's There? Tad lives in Brooklyn with his wife, their two children, and a dog (who will soon star in a book of his own! ).